The benefits of deep breathing, stretching and moving through a series of poses in the various schools of yoga are now well-accepted and enjoyed by many of us in the West, myself included. One issue that’s often come to my mind during these class periods of introspective thought (when I’m able to think beyond the odd angles my body is creating) is the amount of petroleum products that — literally — underlie my yoga practice. Many yoga mats contain toxic phthalates, dioxins and heavy metals, which aren't the best materials to regularly inhale deeply while you hold downward dog. 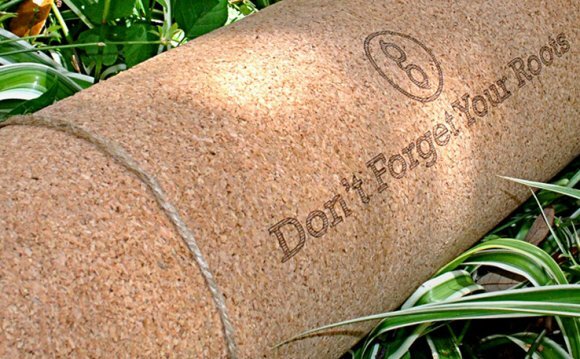 Natural Home Products, which has developed several lines of consciously created products made of sustainably derived materials, has come up with a potential solution: a recycled cork yoga mat. Currently only a prototype, the top layer of the mat is made of the recycled cork material, and the underlying layer is recycled rubber, which provides the grip the yoga mat needs to help you hold your poses without sliding across the room. I decided to give the recycled yoga mat prototype a run for its money. I thought it only fair to put it through several yoga methods, so I attended a variety of yoga classes ranging from a calm, meditative class targeted for older/injured participants to 90-minute Bikram (read: hot) yoga classes. The mat shows no wear that I can tell, and even the serious amount of sweat that dripped onto the mat during the several hot yoga classes I attended didn’t seem to cause any problems (or smells — surprising, I know). The recycled yoga mat didn’t slip once, not on tile or waxed wood floors, and it was thick enough to protect my knees and wrists during poses where these joints were put under weight pressure. It's not as cushy as some yoga mat brands, but I don't find that I need a super-thick mat. The cork yoga mat is heavier than a standard mat, and as a result a bit awkward to roll up, unroll and carry around. Especially to nearby classes where I walked with the mat under my arm, I noticed the weight difference. What are the most important qualities in a yoga mat to all you (likely more experienced) yogis? Do you consider the materials of the mats and other yoga products you use in your practice? Does the idea that your wine-drinking practice could now support your yoga practice sound as exciting to you as it does to me? Leave your thoughts and comments below.